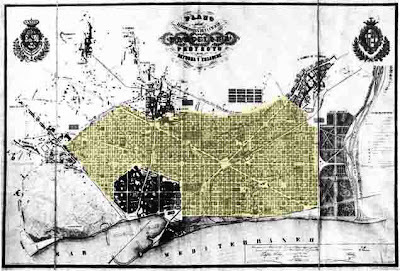 In 1859, shortly after Baron Haussmann was commissioned by Napoleon III to redesign Paris, Ildefonso Cerdá Suñer designed an urban extension to the city of Barcelona in Spain. Instead of military advantages, Suñer focused his urban planning around the concepts of efficiency and sanitation. His designs included open, green space for people to exist in as well as infrastructure to support the growing city of Barcelona. He called this extension the "Eixample". In these original plans of the Eixample, you can see a spoke-like pattern of streets, much like the design seen radiating from the Arc de Triomphe in Paris. These wide streets and a grid-like pattern help to organize the streets in a way that is logical and easy to maneuver through, even in current modern vehicles. The streets widen at every corner as well, further emphasizing the original desire for space and efficiency. While the plans were revised more than once, the primary characteristics of the original plans were maintained. The neighborhoods contained within the Eixample would go on to house architectural works by Gaudi, easily integrated due to the original efficient design of Suñer. Tis is an excellent instance of taking a example we studied in class and applying it to another case study, demonstrating how principles can be brought into other settings. Further research would allow you to ask questions about the political and economic power structure i Barcelona at the time, what were contemporary discourses on modernity, hygiene and urban design.